If camping is in the cards for you anytime soon, you know it’s all about preparation—taking extra precautions that you’re prepared for unforeseen circumstances. So along with your tent, hiking shoes and compass, it may be a good idea to add a USB connected SteriPEN UV water purifier. You never know when you’ll run out of safe drinking water. If you’ve been camping all your life, you may have already heard about SteriPENs, and when you have been using them for quite some time, you may be familiar with the fact that they quickly consume battery life. That is why the people behind SteriPEN thought of the brilliant, logical idea to use a universal technology interface to combat that issue. 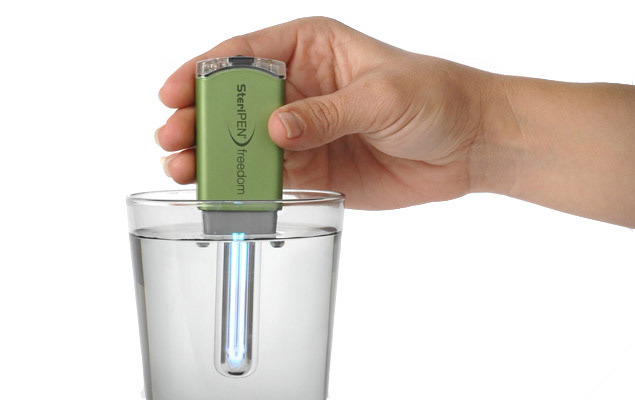 The result is the SteriPEN Freedom USB, which is meant to be an improved rendition of previous water purifier models. The SteriPEN UV water purifier is the smallest and lightest of its kind with a size and weight of 13 x 3.5 x 2.2 cm and 2.6 oz, respectively. It is also the first ever rechargeable UV purifier on the market today and it flaunts a removable lamp cover. The whole USB gadget comes with a USB cable, AC adapter and neoprene case for ultimate protection. So how does the SteriPEN Freedom USB work? The SteriPEN features an engineered germicidal Ultraviolet light that is capable of destroying up to 99.9% of bacteria, viruses, protozoa and all other culprits that can harm your body and send you to the bathroom in an instant. To use it, just remove the lamp cover. Then dip the USB gadget in a half-liter of water and it can disinfect your H20 in less than a minute (48 seconds to be exact!). When you run out of energy, you can easily charge and recharge your SteriPEN through a micro USB connector. A single charge can do up to 40 treatments! Although SteriPEN is considered more of a camping staple and not a life-saving tool as it seems to be. However when used by a charitable organization, this USB gadget could still do wonders for those who don’t have access to safe drinking water. If you’re into camping or helping those in need, you can buy the Freedom water purifier for $120. How would you use the SteriPEN USB? Share your thoughts with us! This entry was posted in Articles, SteriPEN, SteriPEN USB UV Water Purifier, USB Devices, USB Future, USB Gadgets, USB Technology and tagged Portable USB UV Water Purifier, rechargeable UV purifier, SteriPEN, SteriPEN Freedom, SteriPEN Freedom USB, SteriPEN USB, SteriPEN USB UV Water Purifier, SteriPEN UV water purifier, USB gadget, USB UV Water Purifier, USB water purifier. Bookmark the permalink.